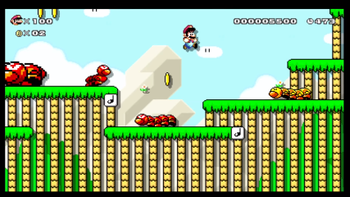 World 18-2 is the second level of World 18 of Super Mario Challenge from Super Mario Maker for Nintendo 3DS. The course starts out with a bridge over Ice Blocks with Blurps nearby. After some Wigglers and a gap, the player can get a Super Mushroom from a ? Block. While meeting other Wigglers, the player also encounters Conveyor Belts, Semi-Solid Platforms, Note Blocks, Mushroom Platforms, and Donut Blocks for ground. Near the Giant Gate are two big winged Wigglers, as well as a smaller a little before, to help get a 1-Up from the Giant Gate. Goomba - Jump on all Wigglers and then reach the goal. Bowser - Reach the goal without jumping on any Wigglers. This page was last edited on August 31, 2018, at 16:40.